After two good evenings fishing with a total of 22 bass and 3 mullet all my pals were keen to give it another go the following day. However, Mother Nature took a hand. The wind increased and blew strongly from the south. When we arrived at the beach a big swell was already eroding the remaining piles of weed. 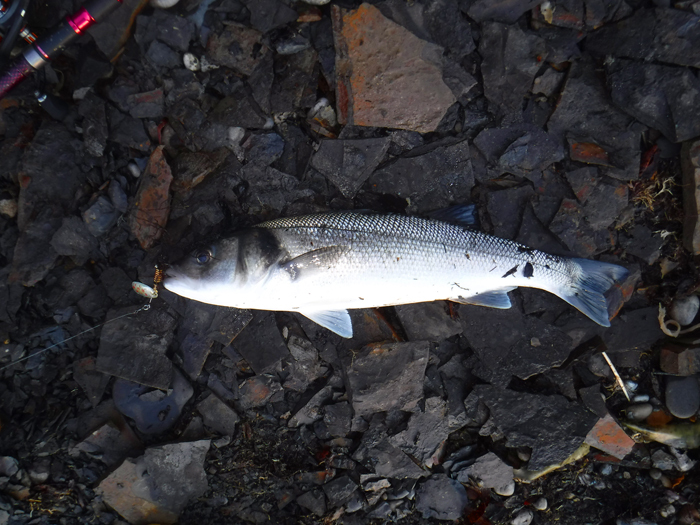 One or two bass and mullet were clearly visible, very close in, gulping maggots from the water but they were patchy and erratic in their behaviour - nothing like the previous nights. The problem was that it was almost unfishable in the edge due to waves, wind and weed. Nigel and Dave flogged away with flies for the mullet. By the time I arrived Richard and Dave had already tried the previous evening's hot-spot but it was very rough. 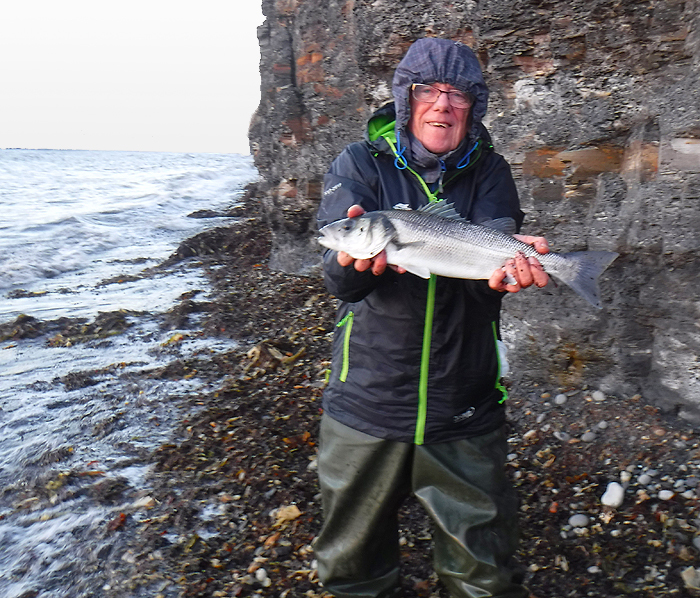 Richard did lose a big fish which was still running as it came off but it had been very difficult fishing and the conditions were just too unpleasant and dangerous so they came back to join us where there was a bit more shelter. We all fished for a while, mostly using flies and weedless soft plastics, but it was awkward and no one was getting bites. Every so often a bass would plough along through the breaking waves with it's dorsal fins sticking out above the surface. 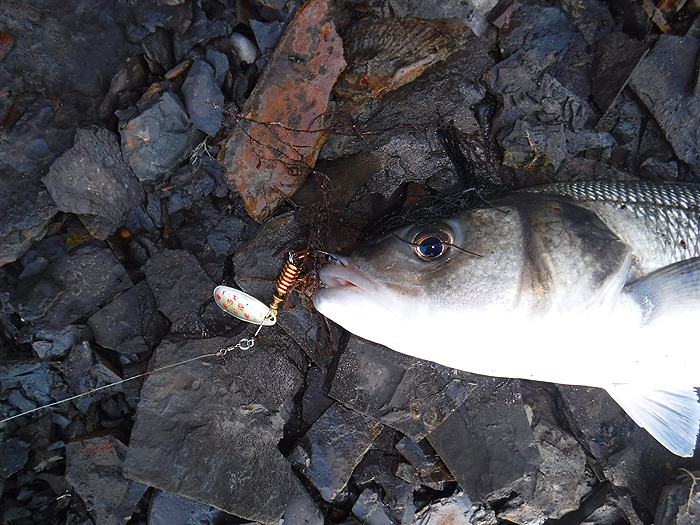 I went back up to my bag and searched for a lure which would give off the maximum flash and vibration in the mucky water. The size 2 Mepps that I'd used to catch my mullet and bass when it was calmer was just too light to cast against the wind so I tied on a size 4 version of the same lure. This just about worked and I was able to get it out a few metres beyond the breaking wave in the weedy margin. I'd had only had a few casts when, to my surprise, there was a strong take right in the curl of the wave and found myself playing a bass. It wasn't the biggest fish in the world but I was using fairly light gear - my little Teklon rod and new Mitchell 2000 - so it put up a spirited battle in the turbulent conditions before I managed to slide it ashore to have its picture taken. After I'd returned my fish the sea had became noticeably rougher and more difficult to fish. Richard and I 'gave them best' and left the others to it. I later heard that no more fish were hooked. Anyway, I couldn't grumble having at least caught something. Perhaps when the seaweed flies have had a go at the mountains of fresh kelp which are now on the beach it will give us at least one more chance of some good surface fishing before the seasonal bad weather closes in. A nice little bass, maybe three pounds, taken in extremely tricky conditions. Close up to show the Mepps which took the fish. I gave Dave my camera and he took a picture for me. Note the new jacket.